ALS herbicides are one of the more common sources of herbicide injury this year. Products in the ALS family tend to be registered for use in only corn or only in soybeans (occasionally both, but more often one or the other). Therefore, either corn or soybeans can be exposed to this herbicide via carryover, misapplication, or tank contamination. ALS or acetolactate synthase is an enzyme that is needed to form amino acids in the plant. The application of ALS herbicides ties up this enzyme, which means the plant is not able to form amino acids. Amino acids are needed to form proteins, and proteins are the building blocks of just about everything. This means that plant is not able form proteins, which means that plant cannot form the materials needed for cell growth. 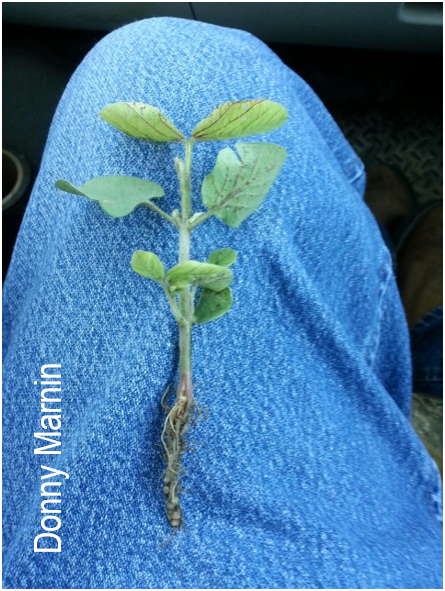 When this herbicide is applied to a plant, it moves both the up and down within the plant, then settles in the growing points. The ALS enzyme is shut down rapidly by these products, but actual symptoms do not appear until 10 days later when the plant begins to tap out its protein reserves. Death, if it is going to occur, will occur within 10 to 14 days. It is not uncommon for ALS products to have a several month interval between application in one crop and rotation to the next crop. 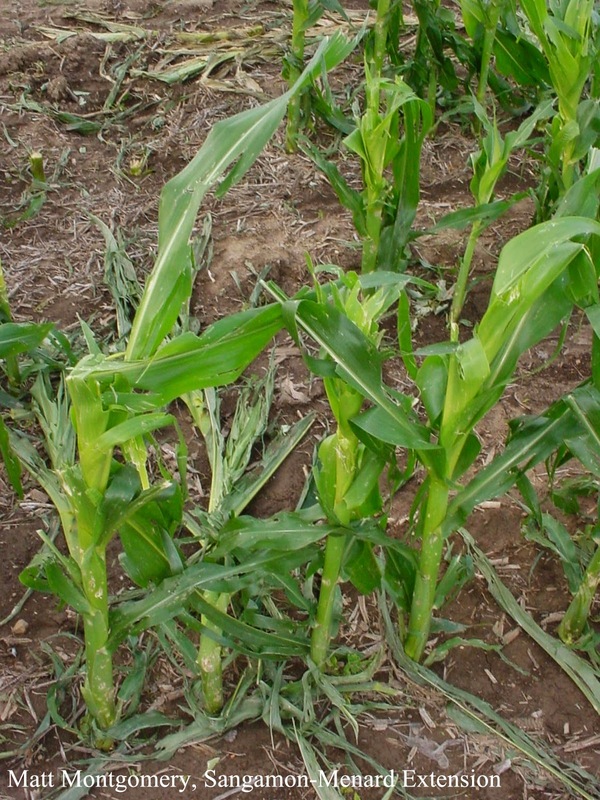 Symptoms of injury in corn can include all or a few of the following: Plants may be stacked, or there is no space between the nodes. 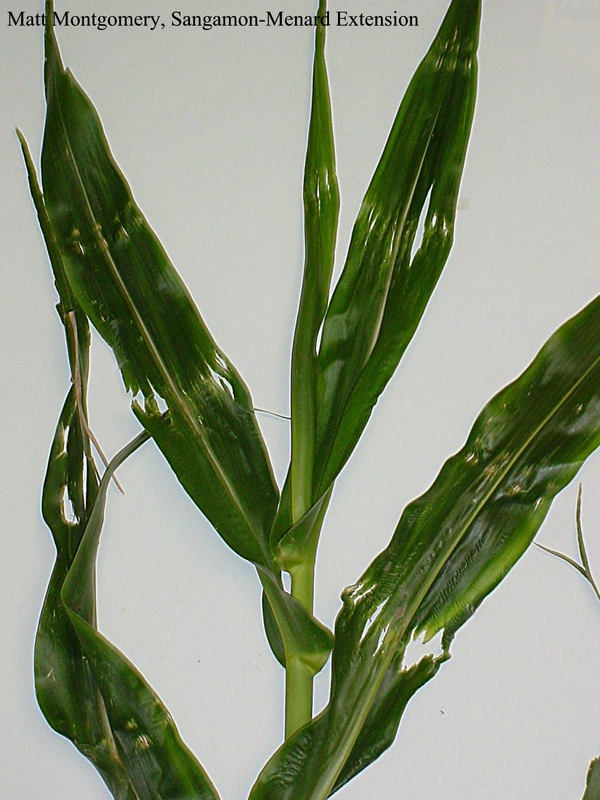 Leaves should be placed alternately on the corn plant, but a stacked plant (lacking internode length) appears to have opposite leaves. Likewise, the lack of space between the nodes means the plant may appear shorter than an otherwise healthy plant. Such stunting may be dramatic. Leaves may take on a yellow or even purplish yellow cast due to lacking chlorophyll formation. In many cases, the midrib of the plant will take on a stark dark purple or red appearance. Because roots also have growing points and because growth at these points may be inhibited by ALS products, stubby or bottle-brushed root deformation is a possibility. 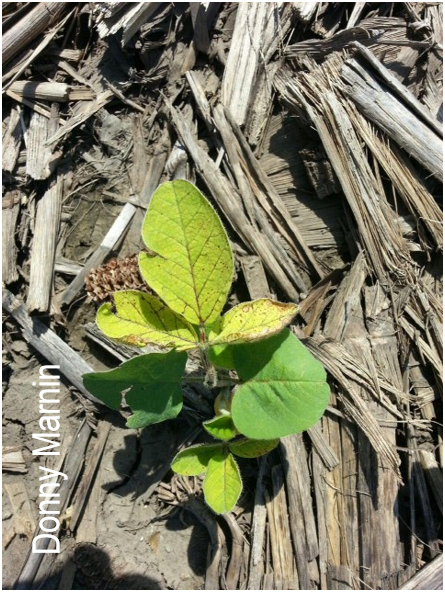 Symptoms of injury in soybeans will parallel those in corn, but the nature of the plant may cause those symptoms to look less similar. For instance, stacking does occur, but this causes the bean plant to appear “bushy” due to lacking stem elongation. Leaves will also yellow, and the veins on the underside of the leaf will also appear red, brown, or purplish in color. As the planter runs along this North Central Missouri field, 10 year old Wyatt Link sits in the tractor with his Dad and is helping to plant what is to be his first crop of beans. Wyatt says, “I am pretty excited about my three acres of Power Plus soybeans and now that they are planted, I can’t wait to see them pop up!" Wyatt was given three acres to plant Power Plus 37F4’s. These are a Roundup Ready bean in the Burrus line up of products. Wyatt’s field is right next to his Grandpa’s, Rex Wood. Rex had been using the three acres as hay ground, but the ground had become very rough and weeds were starting to take over, so he gave the acres to Wyatt. The hay was taken off and the soybeans were planted right into the sod, and it will leave a cover on the ground that will help to hold in moisture. In a few days, glyphosate will be applied in hopes to kill the grass weeds. Now that the beans have been planted and received rain, we are going to follow the progress of these no-till soybeans, right along with Wyatt and see how his first crop as a farmer turns out. This young man has Big Dreams as he is learning to become a Farmer. We have had some questions and concerns from those in Central and Western Illinois on when to scout for European Corn Borer, because they found out that their conventional (non-GMO) corn had been infested during last growing season, but when it was too late for treatment. 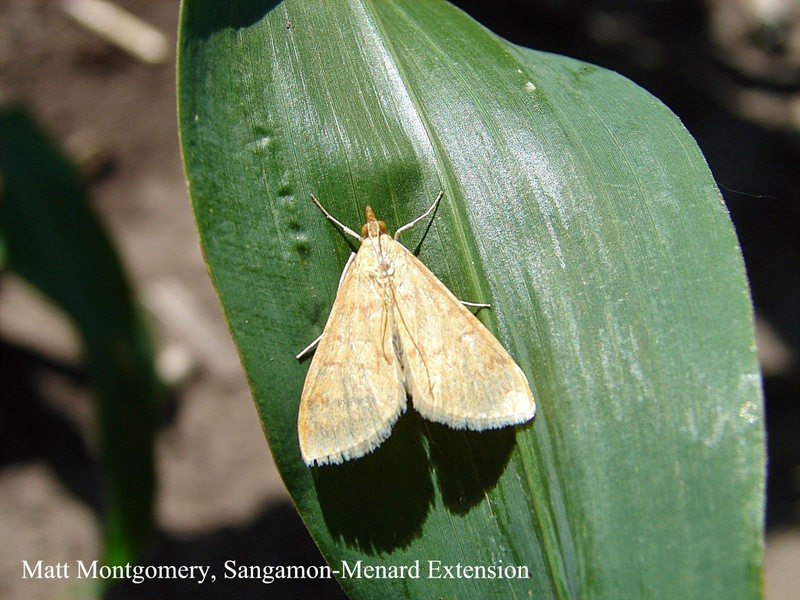 You can keep track of European Corn Borer moth catches for Illinois at 2014 Illinois European Corn Borer Monitoring and Missouri at MU Pest Monitoring Network. Thus far, there have been ECB moths found in Pike County in Illinois. There were ECB moths trapped on May 22, 31, and June 6, 20, 2014 within the Southwest region of Missouri as well as on May 23, 2014 in East central region of Missouri. The Illinois Water Survey provides a Daily Pest Degree Calculator, where you can enter in the date of "significant" moth catches for a specific location in Illinois and obtain the actual total of accumulated degree days for the European Corn Borer (ECB). Most recently, there were ECB moth catches in Pike County on June 16th, 18th, and 19th (as of June 22, 2014). Based on the accumulated degree days provided to us by the Daily Pest Degree Calculator, mating and egg laying should be taking place at this time; therefore, you should be scouting for egg masses. Scouting for larvae and damage is the secret to first generation scouting. However, scouting for egg masses becomes critical to managing corn borer thereafter. 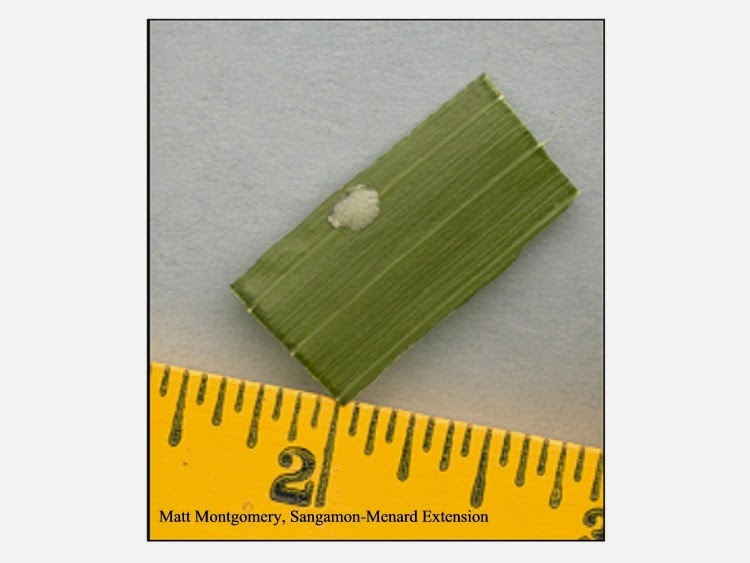 Growers should examine twenty plants in each of five locations for egg masses. Egg masses will be found on either side of the leaf midrib on the underside of the leaf. Larval feeding usually appears as rows of holes that occur in newly emerging tissue. Thresholds for leaf feeding borers will vary depending upon the value of the crop, product used, expected yield, etc. Thresholds also vary for subsequent generation egg mass scouting. Each egg mass probably results in about only four surviving larvae and this is factored into the general threshold. Dear Deer: Please leave our Burrus Crops Alone! Many recent field visits have been the result of dear. You would think that this injury is easy to diagnose, but, in some cases, it can be tricky. Deer tend to bite off the newest growth in a field. 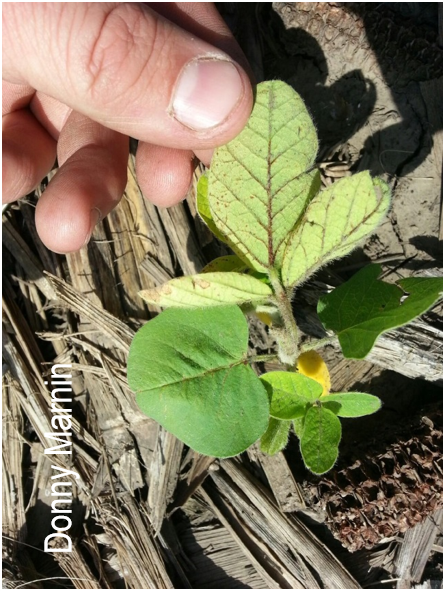 In beans, the may give plants a stunted, almost chemical injury type appearance when viewed from the road. However, a closer examination will show that new growth has been clipped off. 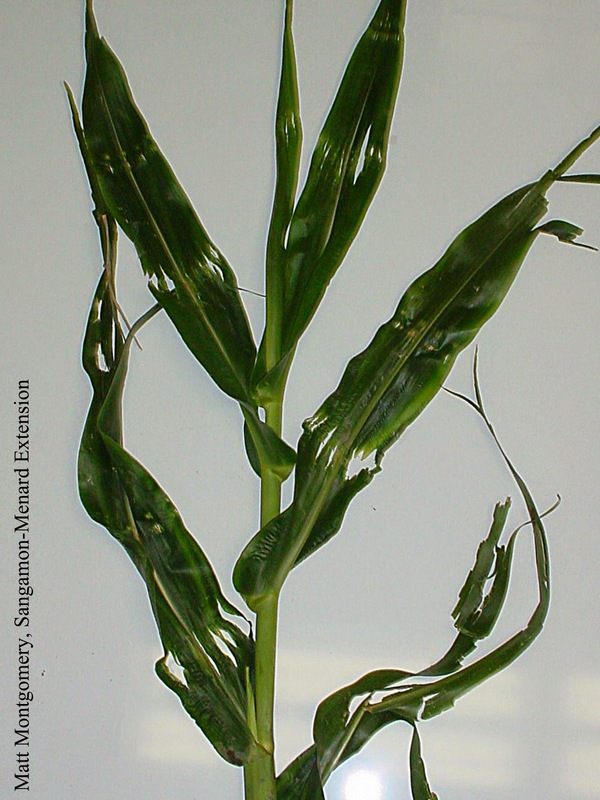 Corn recovering from such injury often takes on a “telescope-like” appearance as new growth emerges from injured regions one set of whorl leaves at a time. When more mature, ears will be gnawed off at the tips. The presence of hoof marks around such injury can help with diagnosis. So What Can Be Done? Management may, in some extreme cases, require the purchase of a nuisance permit from a state Department of Natural Resources. However, in many cases this is too little too late and in many more – hunting the pest will not solve this or future problems. Repellents may also be an option. However, the effectiveness of repellents is pretty questionable in most cases. Some have occasionally recommended that an alternate food source be broadcast (cracked corn for instance). In the most extreme cases of wildlife crop injury, this may be an option. However, many agronomists approach this option with apprehension because they know that the barrier between distracting wildlife from a crop and attracting wildlife to a crop is very, very thin. Keeping nearby waste areas mowed is perhaps one of the better recommendations for managing wildlife. Mowing creates a barrier between the crop and wildlife habitat. More importantly, mowing reduces cover and exposes wildlife to predators. 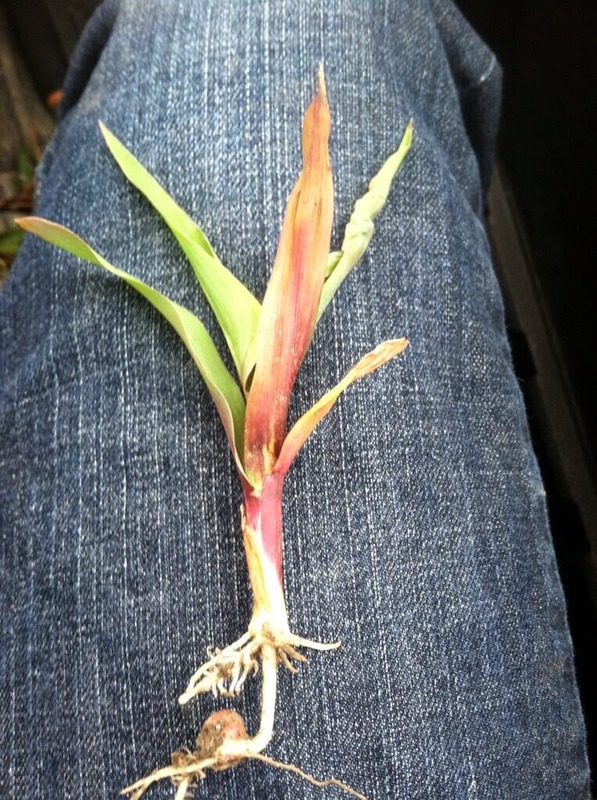 Is There Hope for Hail Injured Corn (> V6 Growth Stage)? 1.) If the growing point or region surrounding that growing point appears damaged, the producer may want to discount that plant as a viable, yield producing plant. Even if it does survive, tillering or stunting may result. 2.) If the growing point has been bruised, factor that in it as a potentially lost plant and reference the chart on page 18 of your 2014 Growing Guide or Should I Replant my Corn? (remember – we never hit potential yield, so this number represents the maximum possible loss in that field). 3.) DO NOT BASE YOUR IMPACT ESTIMATE ON HOW BAD THE FIELD LOOKS – SLICE OPEN PLANTS. THE APPEARANCE OF THE FIELD AT THIS POINT IS NOT DIRECTLY RELATED TO HARVEST-TIME YIELD! Leaves were shredded from the plant and some plants were shredded at nearly ground level. The corn crop was around V8. This picture shows how the leaves initially showed some funky symptoms, but became progressively better as new leaves emerged from the whorl. 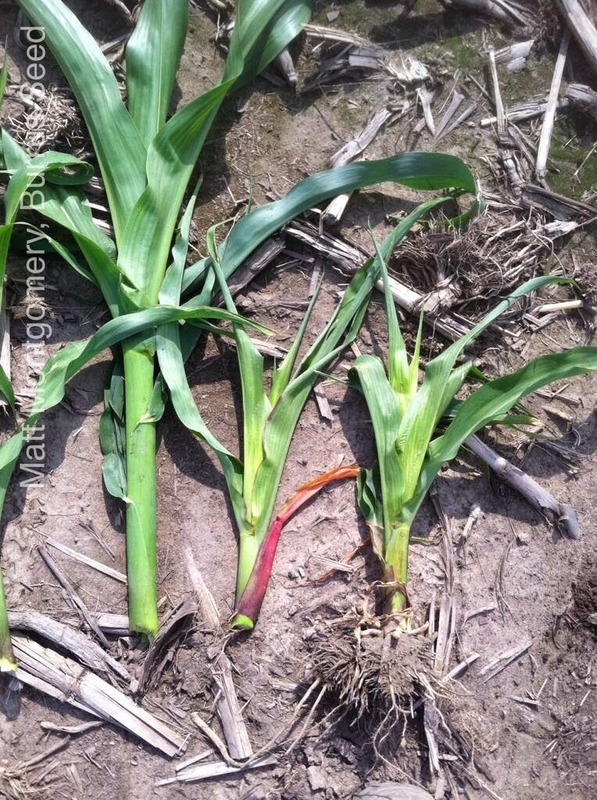 This picture shows how the entire plant in some of the roughest areas of the field looked two weeks after the hail. The end result was some odd looking leaves for a while. Eventually, you could not tell that the field had suffered this type of severe injury, and we did not see an impact with the combine. What Kind of Spring-Applied Nitrogen Loss Will I See Following Rain? Assumption 1: It will take a few days for nitrogen fertilizer to convert into ammonium. The first step on the road to nitrogen loss usually involves nitrogen being converted into ammonium. Needless to say – most nitrogen sources are converted (at least briefly) into a form of nitrogen that can be stored by the soil (ammonium). While the transformation into this form is not a really long delay in the nitrogen loss process, it is still a delay in the process of nitrogen loss. We need to factor some kind of delay into any educated nitrogen loss guess. Assumption 2: Ammonium will convert over to nitrate at a rate of about 1 percent per day in the spring. The second step on the road to nitrogen loss involves nitrogen being converted from ammonium into nitrates. Nitrate should be thought of as a form of nitrogen that is not held well by the soil and that is prone to being “chewed on” by microbes. The actual rate of conversion into nitrate may be more like 0.8 to 1 percent per day depending upon location, environment, etc. However, we need to establish some numbers to work with, so we will run with the higher end of that range. Once again, our goal is to guess at nitrogen loss, and this at least helps us start to get to an educated guess. Assumption 3: Denitrification of nitrate occurs at a rate of about 5% per day of saturated conditions. For now, we will assume that no nitrification inhibitors were used, which would slow that conversion down. Think of this process as simply nitrate being changed into a lost gas by “little critters in the soil.” A few days of super saturated conditions are probably needed back to back before this process begins in earnest. In other words, anything less than a few days of saturation/semi-ponding will result in nitrogen losses that are extremely low. Go beyond those few days and our best guess (we stress guess) would be 5% loss per each subsequent day of saturation. So Where Does That Leave Us? How much Nitrogen might we have lost following recent rains? Let’s consider nitrogen losses associated with three different periods of time this spring (just to keep things simple). Let’s think of nitrogen being applied one month ago, two months ago, and about two and a half months ago. Remember it takes a few days for us to reach that first stage in the nitrogen loss process (conversion into ammonium). After that, conversion into a vulnerable form occurs at a rate of about 1% per day (nitrogen switches over from ammonium to nitrate). That probably means that a quarter of the nitrogen applied a month ago is available for potential loss, more than half of the nitrogen applied two months ago is at risk, and about 70% of the nitrogen applied two and a half months ago could be lost (if some other “bad things” happen). Let’s say this is the upper end of where we might be – this might be the most nitrogen converted over to a potentially lost form. Now we need to consider what loss might have actually looked like following rain/ following soil saturation. Let’s think about two different saturation scenarios. Let’s consider a situation where the soil has been saturated for a few days (let’s say five) and a situation in which the soil has been saturated for several days (let’s say ten). Five days probably represents the more common scenario if you encountered ponding, and ten days of saturation represents what happened to a few unlucky growers. Remember, it takes a few days for saturation-related nitrogen losses to kick into gear. So five days of saturation probably acts more like an actual day of nitrogen loss, and ten days of saturation probably acts like a few days (let’s say five to make it convenient). Remember, we also said that losses of nitrogen as a gas occur at about the rate of 5 percent per day. That’s 5 percent of the “at risk form” of nitrogen, not 5 percent of the total nitrogen applied. That is an important difference. The math can get a little tricky to type out, so let’s use a chart to describe what these scenarios might look like. We have, in many ways, set up the worst case scenario in the above chart. We have assumed the upper end of the range for nitrate formation, we have assumed 5 percent lost nitrate nitrogen per day of saturation (following a few days of saturation), and we have assumed that the 5 and 10 days of saturation occurred at one time rather than being spread out over a period of time. We also considered nitrogen application to occur in one shot. We did not open the door for a split application of nitrogen. Back off on any of those and the actual amount of nitrogen loss is probably less than what we would guesstimate here. For instance, split nitrogen applications would result in less loss than what we see here. As you can see, many growers likely encountered nitrogen losses that ranged from a percent to a few percent at the max (considering the 5 days of saturation scenario). A few unfortunate growers may have encountered some double digit percentage loss at the max. Was this Winter Cold Enough to Kill Corn Pests? Are your Weeds Trying to Tell you Something?